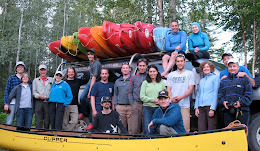 For the last two years, kayakers from around the north have met up in Smithers for Boon Fest. The festival is named after Finlay Boon John, Sam and Timm's little boy (pictured above with his dad) who celebrates his birthday on the same weekend in May. This year, Deanna, Luke, Kim, Chris and myself from Prince George made the trip. The spring thaw has been slow in BC, and with an above average snowpack and the recent very warm weather forecast, river levels were expected to be on the way up. We arrived on Friday night to find just that --- Tatlow Falls, one of the great park n' play spots in the north, was raging and the Bulkley River was nearly bank full. That evening we watched the rising water until the early morning. The next day, the sun was shining and it was super nice. For those that haven't been, Tatlow Falls is a gorgeous spot, with great views of the Babine and Telkwa Mountains, as well as Hudson Bay Mountain. Later in the AM, a few of us got out on Tatlow to surf. Click on the smaller images below for a larger view and check out the mess to the left of the surfers - one of the worst holes in the northwest. 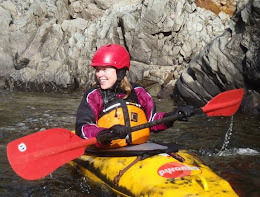 We didn't last long however --- water levels were rising making the eddy increasingly difficult to catch and the wave stickier. More and more wood was coming down the river as well, so we took off to do the Telkwa River --- a fast and fun boulder garden run that was also running very high. Afterwards, some went to surf the infamous Mo-Town wave below Moricetown Canyon. Later back at Tatlow, Sam dished up Boon's birthday cake, while Timm gave out some great prizes courtesy of Aquabatics and WRSI. The evening was spent around the bonfire chatting and watching a few of the latest kayak vids on a big outdoor projection screen - a nice touch. On Sunday morning the sun was blazing again and the water levels were up higher still. 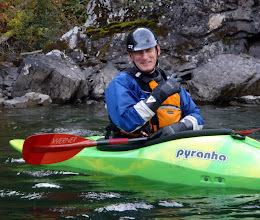 After it was collectively decided not to do the Suskwa River on account of the flood levels and wood, Sean and Dave left to do the Kitseguecla River, while others either hit the Telkwa again or went on a pleasant Bulkley float-a-thon back to Tatlow. The plan was to hit Mo-Town wave again afterwards, but we were foiled as the wave had flushed out -- eegads!! So Luke and I headed-off to do the Telkwa, which by this point was in the trees and almost above the road. Actually some pretty great one-time surfs, and several supringly large wave trains. Check the grafiti on the left and the best new playboater in the northwest on the right. The next morning after many failed attempts to catch the eddy and get on the wave, Sean officially declared that Tatlow was too high. Not sure what the level was, but entire trees up to 60 feet long were coming down. Anyway, thanks to everyone that chipped in to make this festival work, especially Timm and Sam, Dylan, Sean for garbage duty, Deanna for driving, and everyone who made it out. Good times! We heard the level was quite low (0.95 m on the gauge), so we didn't really know what to expect. Despite a few bumps and grinds however, it was all good boating with lots of technical drops and rapids. Chris going deep above, and here`s a few more of the named drops below, something Mel`s Hole I think, and maybe Carousel. We finished off the day by unsuccessfully searching for this mysterious play wave near Alison's Pool, then tried to fire-up Chris for his big downriver race by chasing him all the way back to the campground through Tamihi Rapids. Instead of racing, which incidentally went off like 1-2-3, Luke and I took advantage of what was probably the best thing I've ever seen at a paddling festival: a hot tub! This was run by Don Jamieson out of Sea to Sky Kayaks in North Van. Don's a rad dude for sure, and it was definitely nice to soak in 110 degrees after a cool day on a cold river. After some dins and a few beers, we met these jokers --- recognize anyone? Original H20 and Clearwater Matt. Hilarious! Pretty soon it was night-time and we all gathered around the fire. It was great to catch up with old friends like Kaya Downs, and meet some new ones. Awesome prizes were raffled off and then the band took the stage which was quite literally unbelievable. First gig ever for them we think. The highlight had to be when a member of the audience was invited on stage to play along with the cowbell. His solo was mind-blowing! We laughed until the wee hours. Even after enduring an encore of Don McClean's American Pie. On one of the last drops in the Canyon, Luke busted his paddle on a shallow rapid --- very unfortunate. Luckily, another boater offered his, then he proceeded to C-1 with Luke's broken paddle all the way to the take-out. Pretty nice guy! After, Chris and I did another quick run through Tamihi, before we headed off back north. Great weekend! And well done VKC for an awesome paddlefest. Thanks especially to all the volunteers. We'll be back next year, or maybe later this season when the water's higher.